When it comes to iOS, and related devices such as iPhone and iPad, you must always pay attention to the device you buy. Apple does not guarantee full support to third-party companies, unlike the enormous versatility offered by Android. However, when it comes to devices for fitness, this problem is reduced to a minimum, which does not apply to those who decide to buy a smartwatch outside the Apple Watch. In this guide, we will see what are the various aspects to consider when buying a new fitness tracker for iPhone and which are the best models currently available on the market. Fortunately, there are not many aspects to consider when buying a new fitness tracker. The feature that we must pay most attention to is, as we said earlier, support for compatibility with Apple’s iOS operating system. Most of the latest models of third-party companies are compatible with iPhone. In this guide, we have chosen the best models currently on the market, which guarantee the basic functions, such as the detection of heartbeat, an essential element in such a device. The mid-high-end models, unlike the economic ones, have more features, which contribute to improving the fitness experience. The proposed models are divided by price range. How can we not mention this fantastic device. This is a smartband made by Xiaomi with an excellent quality / price ratio. It offers all the basic functions that an activity tracker must have, such as the sensor for detecting the heartbeat. It is equipped with a 0.42″ OLED display, with which we can interact thanks to a button located below it. One of the highlights is definitely the battery, which allows you to use the device for over 2 weeks. Also you can receive smartphone notifications directly on the smart band, but you cannot interact. This is a great fitness tracker made by TomTom. It is equipped with a display through which you can view the notifications received and view information about our activity. We find an HR sensor for heartbeat detection, suitable for those who prefer to constantly monitor their heart rate. An interesting feature that we find on this smart band is the ability to track the trend of body composition. That is, it is possible to trace the amount of fat mass with respect to muscle mass. Of course we also find all the basic functions, such as heartbeat, steps, distance traveled and sleep monitoring. This model was created to adapt to all types of clothing. It is presented as a simple device, but at the same time elegant. There is a white LED that will alert us of the notifications received. The device behaves very well and offers the main functions of an activity tracker. It accurately tracks the distance traveled and the steps, takes into account the calories burned and monitors sleep. In addition, thanks to the battery is guaranteed an autonomy of 6 months. Water resistance up to 50 meters is guaranteed. It is a tracker that makes ergonomics its strong point. It looks like a compact, lightweight and manageable device that will not strain our wrist during fitness sessions. It is not equipped with a display, an element that we will not feel the need thanks to the excellent app built for iOS. We find 4 RGB LED that change color according to the notification received on our smartphone. Notifications can be managed directly from the app that we can download on our iPhone. This tracker is able to monitor sleep, count steps, distance traveled and calories burned. Furthermore, impermeability is also guaranteed. This is an excellent fitness tracker made by Garmin. It is equipped with a retractable OLED display that is activated when we turn the wrist or with a simple tap on the screen. Thanks to the display we will be able to view the notifications received on our smartphone. Obviously, the HR sensor is the detection of heartbeat. A noteworthy feature is the calculation of the VO2 Max, which is the maximum volume of oxygen that can be used by your body during training sessions. it is also equipped with Garmin Move IQ technology for automatic recognition of the activities carried out. This model is equipped with a continuous heartbeat monitoring based on purepulse technology. The Fitbit Charge 2 is equipped with an OLED display, thanks to which we will be able to view the activity statistics and display the notifications received. It also helps us to relax with guided breathing sessions. Obviously, it is equipped with all the basic functionalities that an activity tracker must have, such as calculation of the distance traveled, steps, control of calories burned and sleep monitoring. There is the possibility to record the exercises with the multi-sport mode to view all the statistics in real time. 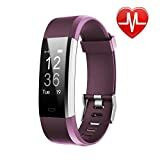 1 LETSCOM Fitness Tracker HR, Activity Tracker Watch with Heart Rate Monitor, Waterproof Smart Fitness... 3,544 Reviews $29.98 See Offers! 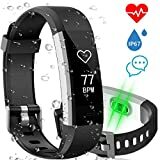 2 Aneken Fitness Tracker Watch Activity Tracker with Heart Rate Sleep Monitor IP67 Waterproof Smart... 184 Reviews $37.99 $25.99 See Offers! 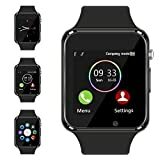 3 Bluetooth Smart Watch - Aeifond Touch Screen Sport Smart Wrist Watch Smartwatch Fitness Tracker... 20 Reviews $25.98 See Offers!